Recently I was thumbing through Instagrams “Explore” section when a piece of colorful botanical artwork hooked my attention and brought a pause to the current scan-and-swipe session. The painted Pachypodium in front of me was the handiwork of Saori Ohwada, a Japanese painter who draws inspiration from the natural world to render your favorite cacti and succulent specimens in colorful acrylics. It’s light, almost playful style but one which remains true to the natural forms of her subject matter. I reached out to find out how Saori got her start, the inspiration guiding those brushstrokes, and what’s on her specimen wish list. To start, where are you from and how did you get your start as an artist? I was born in Fukushima, Japan and I graduated from the Japan art institute in 2005 where I studied graphic design. I originally wanted to design CD jackets and event fliers so I ended up working for a company designing product packaging, shirts, fliers, etc. Are there any painters or other types of artists you would consider an inspiration or influence on your work? When I was a kid my parents were a big influence by taking me on a lot of day trips to the mountains, rivers, as well as to plant gardens. My dad did do some gardening and bamboo work while my mom did oil painting and flower arrangements. I’m also inspired a lot by Tomitaro Makino, a Japanese botanist who produced amazing botanical art. When I’m painting I sometimes refer to The Collection of Makino’s Botanical Illustrations and Xerophile for added motivation. Have you always been a painter of cacti and succulents or did you begin with other subject matter before moving into plant life? After graduating art school I mainly painted things like animals, humans, but I was in an artistic slump. Eight years I became ill and I ended up being hospitalized for a month. But after it was all over, I felt like I was starting a new life. I remember one day filled with sunlight, the air smelled fresh, and I remember feeling very moved by the sight of a pine tree swaying in the wind. After that, I started to regularly begin painting trees and plants. Which cacti and succulents do you enjoy painting the most? Any particular specimens which have presented a unique challenge? I mainly like painting cacti these days. Mainly small ones but I would like to start painting bigger ones. The one specimen which took me the most time to paint was a Dioscorea elephantipes. What medium do you use to paint your subject matter? I use acrylic gouache since my pieces require multiple color coats. I mainly use Turner-brand acrylic paint because it has so many colors, especially the Japanese series. Have you ever done any solo shows of your work? Yes, I’ve done four solo shows with the first being about six years ago. it was a solo exhibition with the theme of trees and humans. I was really nervous but it was also a really special moment for me. What is the largest painting you’ve ever done? What was it, who was it for, and how long did it take? Do you prefer working in small or large scale? The largest piece I have done was a mural ordered by a hot spring hotel and café, both paintings took me a week to complete. I prefer doing smaller pieces but I’d like to paint more mural art but the concept of murals really isn’t understood in Japan yet. If I have a chance I’d like to paint more of them while traveling abroad. Is painting just a passion project for you or is this something you’re able to make a living off of? Currently I’m able to make a living off of my painting. It’s hard work at times but my partner supports me all the way. I hope to come to the U.S. to make a living just through painting in the near future. Obviously since you love painting cacti and succulents so much, what genus(s) and specimen(s) are you drawn to the most? Where do you get your plants in Japan? 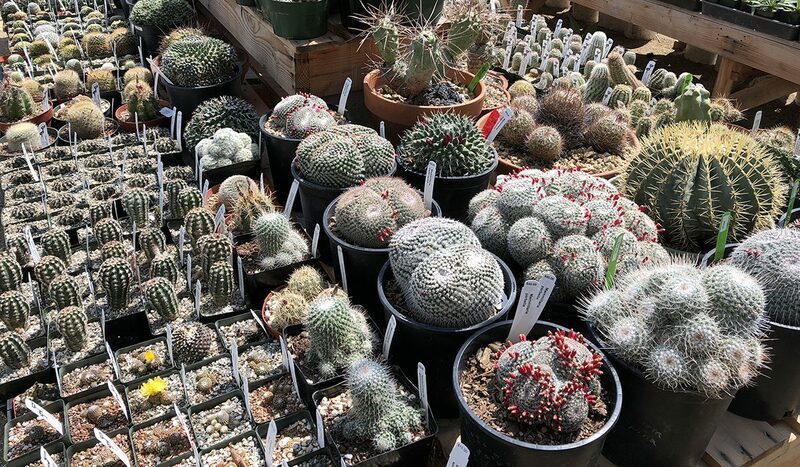 I like Agave and cacti in general because they ‘re so cold tolerant; in particular I really like Copiapoa monstrose, Astrophytum, and Aztekium. I really want bigger cacti and succulents because right now I only have smaller plants. I usually buy my plants at Ozaki Flower Park. They have a lot of specimens there and sometimes I also attend botanical events as well such as BOTTA which was last month from Feb 24th-25th. What were your impressions of the various plant populations you saw while visiting the states? It’s impressive to see how big plants get in the U.S., especially when they’re just growing that large in the wild. When I was surprised to see agave and other succulents in street planters and along sidewalks; this is compared to Japan where the climate doesn’t make it easy to grow those types of plants. In Japan there are some cacti and succulents which are hardly ever seen outside of clubs so all of the impressive specimens I saw during my visit really inspired me.